Hello world! Welcome to my comic: Stand up Gaming! If you are reading this I can only assume you’ve decided to read the comic from the beginning so let me take the time to explain how Stand up Gaming works. Stand up Gaming is not one comic, Stand up Gaming is several different comics. It’s like a sketch show, such as Saturday Night Live or All That, and the different comics are like different sketches. 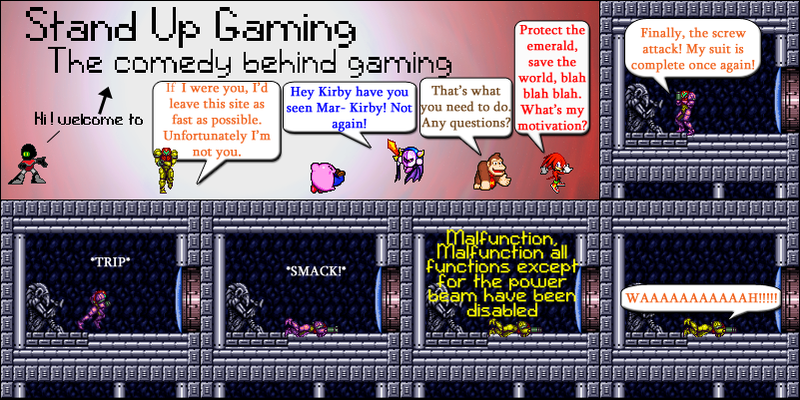 The strip you see above is the first entry in the Metroid: the Search which is your stereotypical sprite comic. It has fourth wall jokes and an author to boot. If that’s not what you’re looking for, I recommend you skip to the next comic: Mario in Kirbyland. If not then start here. Thank you and I hope you enjoy my comic.